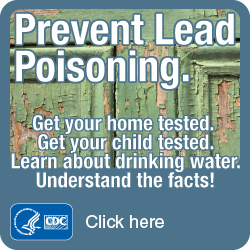 New Information on the Use of Lead Test Kits on Consumer Products -- The Consumer Products Safety Commission (CPSC) has evaluated whether commercially available lead test kits reliably and accurately detect the presence or absence of lead in consumer products, such as toy jewelry and children's vinyl toys. More information. 16-35: Short Title West Virginia "Lead Abatement Law"
"Disclaimer" The links identified below are included because of their relevance to the Lead Program. These links are NOT regulated by the Bureau for Public Health/Lead Program and we cannot be responsible for either their information content or their maintenance. The program information is updated periodically and may not reflect real time data.